Progressive policy making requires both political will and innovative thinking. Bringing these two aspects together, Prime Minister Ranil Wickremesinghe and business leader Dhammika Perera gave insights on what is needed to implement structural changes to Sri Lanka’s economy, and foster growth despite the challenges faced as a developing nation. Both Wickremesinghe and Perera gave their perspectives during the Fireside Chat 2019 event, organised by the Daily FT, International Chamber of Commerce (ICC) Sri Lanka, and CIMA at Hilton Colombo on 19 March. This edition of the Fireside Chat was also the first-ever to feature ten Ambassadors/High Commissioners, from the UK, China, European Union, Switzerland, Canada, Netherlands, Malaysia, Bangladesh, Turkey, and Indonesia, who spoke on a range of issues which impact their respective countries as well as Sri Lanka. Wickremesinghe addressed the second part of the Fireside Chat 2019, and subsequently participated in a discussion that included Perera, moderated by ICC Sri Lanka Chairman Dinesh Weerakkody and Daily FT Editor and CEO Nisthar Cassim. Wickremesinghe also used the occasion to deliver a resounding vote of confidence regarding the private sector’s capacity, insisting that as the engine of growth, they have what it takes to deliver a stronger economy for Sri Lanka, and pledged to provide support for companies to find new paths of advancement. “I have a lot of faith in our private sector and we will pull through. Look at our private sector when the British came in and started the commercial economy in the 1860s. By the end of the century, we were dominating many sectors. We went through the difficult 70s, and the private sector survived that. We have run an economy with a war going on in both the north, and the south, and now we are coming from a period of fiscal consolidation. We all have more experience now. Without the private sector, we will not grow. You are the engine of growth, and you have to keep moving,” he said. Responding to questions on challenges posed by higher taxes and interest rates, the Prime Minister acknowledged policies necessary for fiscal consolidation had presented challenges to companies, but called on the private sector to rise above them. He also emphasised that the Government was working on increasing liquidity in the market, to provide as much as Rs. 300 billion for companies to use for investment and expansion. He also told the hundreds of participants at Fireside Chat that the Government would work with State and private banks, to adjust interest rates to bridge the gap between current rates and those stipulated by the Central Bank. The possibility of revising some tax policies to encourage new sectors to expand is also being considered. “You have difficulties. The private sector must complain. If you don’t, you are not the private sector, then you are complacent, like the public sector,” he said to laughter and applause from the audience. “Don’t be that, but keep complaining, and we will see how we can make the country a little bit better. “You have done well. We are for a market-oriented economy, and we are looking for a larger role for the private sector to play, and no doubt in the coming years that role will expand. You have to learn to compete with the world, and that is what we want you all to do. You can succeed. You are good at it. Let’s make it possible to deliver the goods. It requires a Government and private sector to deliver the goods,” he added. The Prime Minister recapped the economic situation that prevailed when the Government came into power in 2015, which warranted a shifting of gears to prioritise fiscal consolidation. This required increasing public revenue, which necessitated higher taxes and interest rates. With liquidity increases in the market, the private sector could look at new avenues of expansion, the Prime Minister said, pointing out that Sri Lanka has to make a leap from producing non-tradable goods to a greater portion of tradable goods, which would improve exports and attract investment. Such an effort would improve reserves and strengthen Sri Lanka’s debt repayment capacities as well, and set the stage for the country to move out of the low-middle income category it is currently in. “We have to hold fiscal consolidation to go ahead. Everyone can talk about making things easier, but they must tell us how. How are you going to do it, what are you going to change, and what are the consequences? All of us like to be up here to get applauded, and make it good for the business community and for the people, but now that we have reached the first stage, how do we get onto the second stage? That is the transformation of the economy. If we achieve that, then by 2030, the country will be able to reduce its debt. I’m not saying it will come down to about 35% of GDP, but it may come to about 65% of GDP. If that happens, we are home and dry, but we have to handle the transformation,” he said. “We are looking at revising some of the tax incentives, because new business must flourish and new sectors must grow. Secondly, money must be available to the private sector, and there must be cheaper money. These are the basic points we are moving onto. The ease of doing business is more long-term, but it is necessary. Our investments are growing, but I would like it to be much faster,” he acknowledged. Growth was also critical for Sri Lanka, because of the comparatively high amount of debt the country has compared to its peers. Most other countries of low-middle income category have about 55%-60% debt to GDP ratios, but Sri Lanka’s is a higher 80% of GDP. In order to decrease this percentage, the economy has to grow on exports and investment, rather than infrastructure construction funded by loans, which was primarily the main avenue of growth during the former Government. The Prime Minister insisted that if Sri Lanka is able to maintain its fiscal consolidation and achieve growth, it would set itself on the path to reducing debt incrementally over the next decade. Adopting technology is essential to growth, and one way to quicken it, but Wickremesinghe admitted that this was a double-edged sword for the Government. Digitising Government improved its efficiency, but it also meant fewer public sector workers were needed, and politically it was important for Governments to provide public jobs, or risk the wrath of voters at elections. While increasing tax revenue is important for fiscal consolidation, and to provide social security needs such as education, healthcare, and housing, the Prime Minister conceded that such measures required careful consideration. Even though Sri Lanka’s healthcare and other service costs will increase, especially since the country has an aging population, finding new taxpayers without impacting growth required a fine policy balance. Sri Lanka has a complex set of problems, as it is a low-middle income country with high debt, an aging population, and limited exports and investment. As Sri Lanka is facing a bunching of debt till about 2022, the priority should be to ensure the Budget is well-managed. “We have get out of the middle-income trap, but remember that unlike earlier, when our debt was in rupees we did not have a problem going ahead, but now it’s in foreign currency. When the rupee depreciates, it’s even more challenging, because you stay in the same place. This is why you have to get your Budget in order before other changes can take place. Vallibel One Group Chairman Dhammika Perera stressed that Sri Lanka needs to focus on growth that creates jobs and promotes innovation, to move forward from the country’s current middle income status. Participating in the discussion with Prime Minister Wickremesinghe, Perera pointed out that it was important to focus policy on how to create jobs, as it was the most tangible method of experiencing economic growth. He drew examples from the US, where economic development is measured and reported on based on the number of jobs created every quarter, rather than numbers. “When the US economy is evaluated, it is not based on percentage points. Everyone talks about growth based on how many jobs have been created. This is a policy that can easily be adopted by Sri Lanka to understand which areas of the economy is really growing, and what parts of the economy are really reaching the bottom levels of society. When you know which sectors are really making a difference in terms of income generation, it becomes much easier to create policies that identify new sectors and assist them to grow,” he said. Perera pointed out that Sri Lanka’s per capita income, which is about $ 4,000, only grew by $ 50 in the last few years. He noted that for Sri Lanka to grow to become a $ 10,000 or a $ 12,000 per capita country, it would take over 160 years at the present rate. Therefore, he called for Sri Lanka to embrace new technologies, which would open up fresh growth avenues as well as make existing industries more competitive. 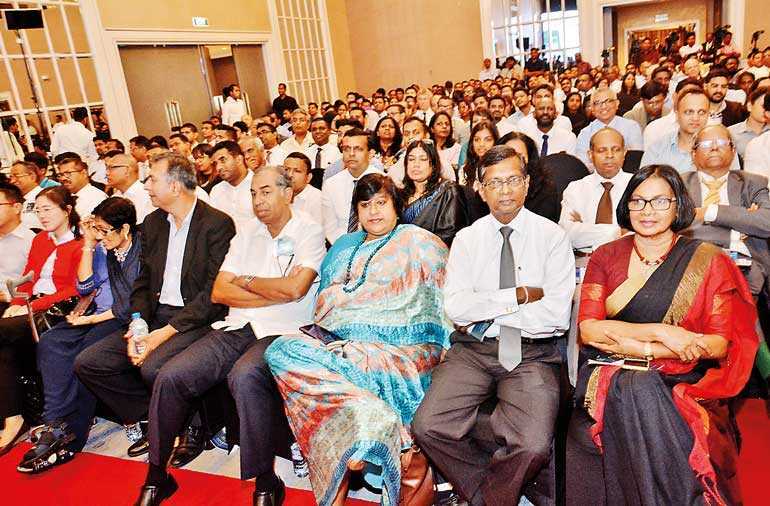 Organising the economy based on job creation and innovation segments would also help the Government earn revenue without constraining growth, Perera pointed out. He contended that understanding growth sectors would also help the Government to manage revenue earning options better and improve governance. Perera noted that the idea that making the economy more efficient, or reforming the public sector, or attracting investment, requires large amounts of resources, was a fallacy. He insisted that it was possible, if there was a different approach from policy makers. 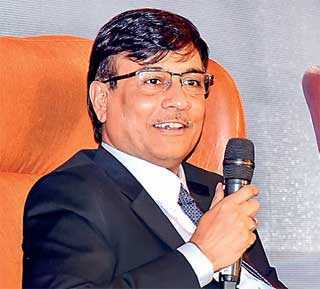 Perera, who has a reputation for being an astute investor, noted that company profits and performance of the Colombo Stock Exchange (CSE) were deeply linked, and when growth moderates, activity on the CSE also reflects that trend. Deloitte India Partner Vishwas Udgirkar observed that the forum with foreign envoys, private sector representatives, and the Prime Minister talking on one platform was a rare occurrence, especially in South Asian economies, and noted that it presented a platform for comprehensive discourse that covered all the essential aspects of the Sri Lankan economy and challenges for growth. The first session, which involved envoys from a number of countries, was focused more on how to improve the FDIs, increase exports, and improve skills for economic development. This included interesting suggestions from the envoys, which touched on the importance of innovation, education, transparency, women’s inclusion, reconciliation, and competitiveness. “It’s a globalised era, and developing nations will have to work to get the full benefits of globalisation. In that context, to take that advantage, you need to have the conducive policies, mind-set changed to move away from the highly protective market environments, use the right technology empowered with digital solutions to enable ease of doing business. Without these, the confidence of global investors will not be established,” he said. He also pointed out education is an important challenge everywhere. Not just producing a higher number of graduates, but how Sri Lanka can focus on both entrepreneurship and improving vocational training. It was one of the key policies adopted by many Governments, and was discussed during the sessions. Udgirkar also observed that the viewpoints of Prime Minister Wickremesinghe were realistic and well-presented. Udgirkar stated that continuation of policies can give the confidence to investors that irrespective of the Government changes, the business environment will remain stable. It is important not to mix political views with economic views. Policy continuation is key in economic growth, he added. Moderator ICC Sri Lanka Chairman Dinesh Weerakkody ended the session by suggesting Deloitte compile a report with key insights to be shared. 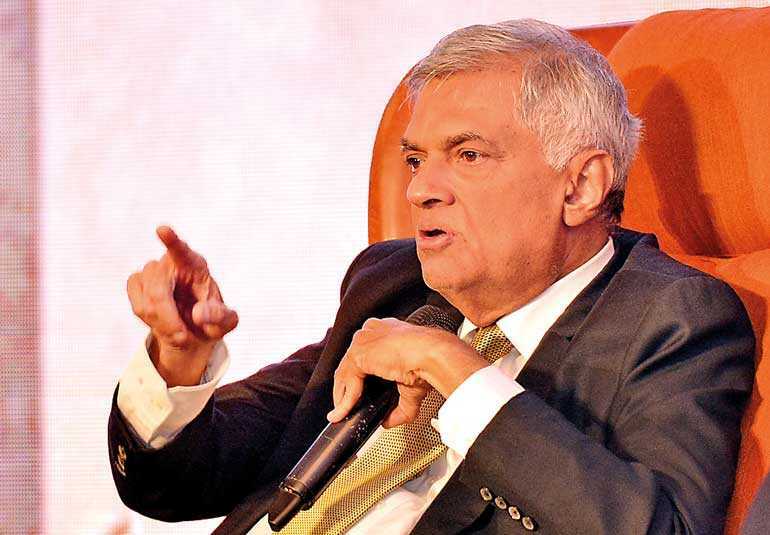 The priority of the Government was stabilising the economy in 2015, which has been successful, Prime Minister Ranil Wickremesinghe said, calling on the private sector to use it as an opportunity to expand their businesses to foster economic growth. Speaking at a packed Fireside Chat, organised by Daily FT, International Chamber of Commerce (ICC) Sri Lanka, and Chartered Institute of Management Accountants (CIMA), PM Wickremesinghe acknowledged that the business environment has been challenging over the past few years, but emphasised it was essential for the Government to focus on fiscal consolidation to stabilise the economy and meet steep debt repayment responsibilities. Nonetheless, he was upbeat that Sri Lanka’s economy was currently poised for structural change, which would increase the production of tradable goods to put the economy on a sustainable growth path. It is customary that at a fireside, something gets roasted. Anyway, I was at Parliament before I came here, so I came partially prepared for the event. Looking at some of the problems you have been facing, it is not surprising you would want to roast me and the Government, but remember we are the only hope. When we took over in 2015, we realised how bad the economy was, how bad it was going to be, and just as much as we wanted growth, we realised fiscal consolidation had to get priority. We had a high level of debt, especially foreign commercial debt, so that meant we had to first get our primary balances positive, and get into a position where we could gradually repay the debt. I remember when Mrs. Thatcher came into power as Prime Minister in 1979. In her first two years of reform, there were riots in the streets of London because it was so tough. Fortunately we ensured we did not go there, because my colleague the (former) Finance Minister started by giving a hefty salary increase to all the Government servants. No Government likes to do what we had to do but the options were few. We didn’t want to go down in history as the Government who took over a bad economy and made it worse. What we have done is to get fiscal consolidation, and now we can be satisfied that we can go to the next level. We have had primary balances positive for 2017 and 2018, and hopefully for 2019. In 2019, we also hope to have a surplus for the current account balance as well. This is after about 60 or 70 years; back then it didn’t matter, because our debt was in rupees, but it matters now because there is a larger share of foreign loans. Our revenue was down. Our revenue as a percentage of expenditure was only 63.5% in 2015, but today it is 75.1%, which also accounts for some of the complaints from the public and private sector, but we had to increase our revenue. We had no other option. All this resulted in a continued deficit in the rupee market from about 2018, but the Central Bank has reduced the Statutory Reserve Ratio (SRR) of the commercial rates by 2.5% to address the liquidity shortage, which has been reduced from Rs. 94 billion in November to Rs. 12 billion at present. This has resulted in about Rs. 150 billion coming into the market, along with funds from Gamperaliya and Enterprise Sri Lanka. We hope this will result in about Rs. 300 billion being released into the economy in the coming months. Sri Lanka’s real interest rates are currently the highest in the region. I don’t think anyone of you will argue with me. You may ask me, “Is it only now you have realised this?” We have taken note in the substantial difference between the market interest rates and lending rates stipulated by the Central Bank, and these are some of the impediments to reasonable economic growth. Disbursements of private banks have remained substantial, in 2018 it was Rs. 765 billion of additional funds released to the private sector, but this credit growth has not been translated into economic growth, because a fair amount of it has gone to consumption, which is seen in the increase in imports. So the Central Bank is now attempting to reduce high market interest rates, without adjusting monetary policy. We have to now talk to both State and private banks on how their lending rates can come downwards with these adjustments, because this is essential for the private sector to get ahead. Continuation of the fiscal consolidation process must go on. We are watching the situation and there will be more measures, but certainly we will have to intervene at some stage to ensure that funds are made available to the private sector. We are also looking at the EPF entering the share market, after a fresh security system has been put in, and the Governor has briefed me that it has progressed well. We have to increase our exports, and in the last few years we have seen the increase of the non-tradable sector as against the tradable goods. We are in the age of transition. We are not going to have growth through a conventional economy. Growth now depends on how fast we can convert into new sectors of the economy. We can no longer be a low-wage economy. We have to realise we are at the high end of the market in South Asia. It’s already apparent, as many of you have invested outside of Sri Lanka, not into more developed economies, but where you can carry out your businesses at a level of wages which makes it competitive. Sri Lanka has to become the centre of the Indian Ocean, the local for business, the local for logistics. Tourism has immense potential. We have to look at new technology, our agriculture has to be modernised. Nature plays too large a role in our economy. You saw how growth was affected in 2017 because of climate change. We have to start laying the foundations for investment, and one of the issues is how to we move on Ease of Doing Business from 100, where we are now, to at least 75. These are the challenges we face, and we need your support to overcome them.